Ford VIN Decoder | Free VIN Check, Lookup Specs, Recall Info and more! Decode your Ford VIN for free and get all the information about your vehicle. VinCheck.info‘s Ford VIN decoder can be used to determine everything from vehicle body and drive type to fuel tank capacity to vehicle safety rating. Enter your Ford VIN below and click on the Decode VIN button to start your vehicle research. Approximately 36,000 Ford vehicles equipped with defective Takata air bags are under recall. The recall covers the 2006 model year Ford Ranger vehicles. According to the recall, the airbag inflators pose a higher risk of exploding in the event of a crash. The affected vehicles are being recalled to replace faulty Takata airbag inflators. All vehicle owners will receive a letter from Ford notifying you of the recall. When you receive the letter, please contact your local dealer to schedule a service appointment, dealers will repair recalled vehicles free of charge. Check to see whether your vehicle has an open recall, do a free VIN check on our online tool to determine if your Ford vehicle is under recall. Visit the NHTSA website for additional information on Takata airbag inflator recall issue or contact Ford Customer Relationship Center in the U.S. at 866-436-7332. Search for Ford safety recalls announced in the past 15 calendar years using the VIN. How to Decode a Ford VIN? 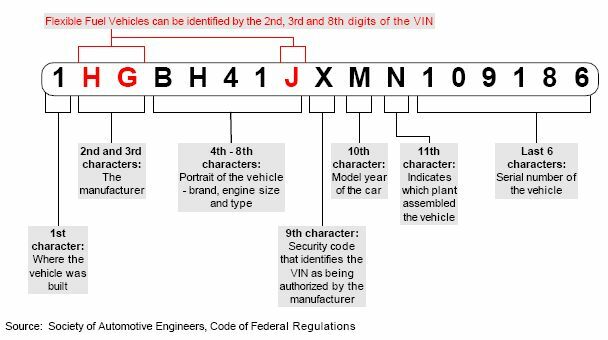 Each character or set of characters within a Ford VIN indicates specific vehicle information including the vehicle’s model and model year, make, where it was manufactured, and more. Here is a sample Ford VIN, 1FDXF46S12EC58316, which we have decoded using the diagram above and the Ford decoding chart. VinCheck.info’s free Ford VIN decoder instantly provides more than these vehicle specifications plus a full vehicle history report. We also provide information on the market value, equipment details, fuel efficiency, safety rating, current warranty, recalls and defects of a Ford vehicle. Whether you’re looking for a set of brake discs, oil filters or flywheels for your Ford vehicle, search by VIN and find the right part for your vehicle at the Ford online store. Ford produces high quality original parts that are designed to fit and enhance your Ford vehicle perfectly. Why should I use a Ford VIN Decoder? Check out VinCheck.info resources on Ford which could be important to you as an owner or as a buyer. For more interesting facts about Ford, Ford vehicles or to get a free Ford vehicle history report, visit our Ford VIN Check page. Enter your VIN below and run a Free Ford VIN decoder in seconds!